This larger size black leather medical bracelet has a brushed finish stainless steel medical tag with engraving on the front. No further discounts on this laser engraved product. Available in Size: 7" and 8"
Engravable Surface Dimensions: 1-1/8" x 5/8"
Engraving - Black Laser on Front only. Fits Wrist/Arm Sizes shown below: Measure where you will be wearing the band on the wrist/arm carefully! Re-sizing Not available on this item. Sizing: Wrap a soft tape measuring around the wrist where you will wear your bracelet to get the correct measurement. Please measure carefully as there is no resizing on this item. 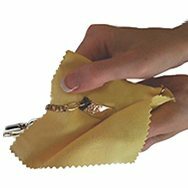 SEF1009 - 7" fits wrist 6-6.5"
SEF1008 - 8" fits wrist 7-7.5"
Leather Care: To keep leather looking nice, do not swim or bathe, or expose bracelet to water as it will damage the leather. Do not wear during sports. We advise purchasing a stainless steel bracelet for 24/7 wear.